Jamie James gives a full, intriguing, detailed history of the island’s visitors and expats, a wild panoply of writers, artists, rogues, madmen and madwomen, and thieves. In The Glamour of Strangers: Artists and the Last Age of the Exotic (Farrar, Straus and Giroux, 2016) — which is a dazzling threading together of biography, travelogue, literary and art criticism, and judicious sympathy — James writes about expatriate artists or what he calls the “artist-exote,” among them Walter Spies (1895-1942), a Russian-born German artist and composer who moved to Bali in 1927, and whose highly detailed, dream-like landscapes have captivated many viewers, myself included. Other figures included in the book — which focuses on six creative personalities — are the writer Isabelle Eberhardt, the poet and novelist Victor Segalen, and the filmmaker Maya Deren, each mesmerizing in his or her own way. Starting with Augustus Caesar, who bought Capri in 29 BCE, and Emperor Tiberius who moved there from Rome in 26 CE. James gives a full, intriguing, detailed history of the island’s colorful visitors and expat residents, including a wild panoply of 19th- and 20th-century figures: Civil War veterans interested in the landscape’s geological formations — especially the Blue Grotto — along with writers, artists, rogues, madmen and madwomen, and thieves. In his conjectural biographical sketch of Tiberius, which is based on his reading of Suetonius and Tacitus, both of whom wrote about this often maligned emperor, James offers his analysis of what the writers are likely to have made up and what might be factual. He even delves into their motivations for developing a particular slant on the emperor. This is just one of the many insights in this always interesting book. The list of the island’s latter-day visitors is impressive and diverse: Marquis de Sade, Pablo Neruda, Romaine Brooks, Maxim Gorky, Joseph Conrad, Mark Twain, Graham Greene, and D. H. Lawrence. A brief sojourn there by Oscar Wilde and his lover Alfred Douglas was said to have inspired others seeking sexual freedom to live on Capri, whose two harbors are hardly welcoming. But James is not interested only in the lives of the famous, but also in lesser-known and forgotten figures. “Capri surely provides the setting for more works of fiction than any other island of its size” is how James opens one early chapter. One of those books — “the finest of the Capri novels “ — is South Wind (1917) by Norman Douglas (1868–1952), whose literary star has long since fallen. In addition to his nuanced analysis of the strengths and weaknesses of South Wind, James goes into detail about Douglas’s life, including the people he knew and which writers have been influenced by his work. James possesses the rare gift to be able to do this: he is both bookish and a world traveler. As a researcher, he will follow a thread whether it is found in a little-read book of poems or in a conversation he has with a longtime resident of Capri. James digs up all sorts of details from Fersen’s life, dating back to his time in Paris, as well as anecdotes about his biographer, Peyrefitte (1907–2000), who boasted that the Catholic Church, which he repeatedly attacked, called him “The Pope of Homosexuality.” James can pivot from a description of the landscape to a subtlety gradated literary analysis, to a piece of unfounded gossip, to a trial record reported in a French newspaper, all in the service of presenting a fuller picture of his subject. If he feels it is necessary, he will digress for pages at a time to reveal a trail he has followed. I never felt disinclined to follow him, nor did I think that he was wandering off the subject. This is what is remarkable about Pagan Light. In another chapter, James briefly details how Futurism’s founder, Filippo Tommaso Marinetti, invited Fersen, who “was losing himself in the amorous reveries of classical antiquity,” to write for his magazine, just as he had contributed to Fersen’s important journal, Akademos. It was “a flirtation of convenience on both sides” because the gay Fersen, who loved the past, was the opposite of the heterosexual Marinetti, who wrote in his Futurist Manifesto: “We will glorify war — the world’s only hygiene — militarism, patriotism, the destructive gesture of freedom-bringers.” This kind of incongruous detail is just one of the animating features of a book replete with biographical information, hearsay, literary critique, history, and much else. James has an encyclopedic knowledge of his subjects at his fingertips: he seems to have read the most obscure and hard-to-find books and articles on his subjects and, more importantly, is able to present what he has dug up in precise, gorgeous prose. He is comfortable reading Latin texts, French fin-de-siècle poetry, and trashy pulp, and discussing the strengths and weaknesses of each. Unless otherwise stated, all the translations in the book are credited to James, a feat in and of itself. If readers think that James is being extravagant in this description, they need to read on as he relates her “marriage of inconvenience” to John Brooks, a well-known freeloader in the circle of the writers Somerset Maugham and E. F. Benson, who also lived on Capri, and her affairs with various women and men, including “the most influential poet of his era,” Gabrielle D’Annunzio. While he is at it, James lists the three reasons why D’Annunzio is no longer much thought about in terms of his writing. This, of course, is what James does throughout Pagan Light. So many interesting people went to Capri in search of some kind of freedom. For years, the island was a haven for people who did not fit into what we now call a heteronormative society. Many were artists, writers, and composers — members of a bohemian world that seems to no longer exist, at least on Capri, which “was,” as one of islanders says, “an international laboratory for the avant-garde, a place where ideas were born, a new artistic vision, and given to the world.” Like so many other places of refuge that — due to their remoteness and geography — were once apart from the world, Capri, he tells us, is now a brand. 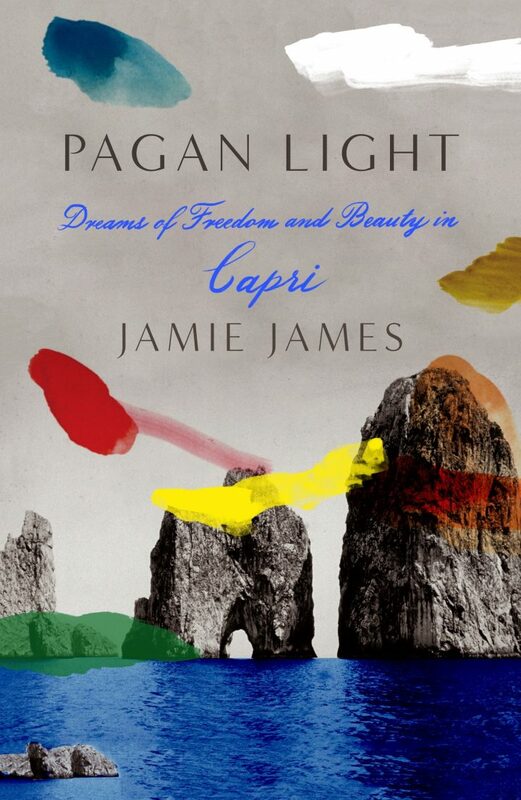 Pagan Light: Dreams of Freedom and Beauty in Capri (2019) by Jamie James is published by Farrar, Straus and Giroux and is available for purchase on Amazon and other online retailers.